Susan McBride, the author of the Debutante Dropout mysteries, was a fabulous guide to the Romantic Times Convention, chairing our panel on “Casting Your Killer Crime Novel.” I bonded with Jessica Speart, who writes an incredible series about a U.S. Fish and Wildlife special agent, Rachel Porter. Our goals for our books are similar—to smuggle important policy issues into a good yarn. And we both love research that takes you out into the field, even if it means that someone might threaten your life. On our last evening there, Jessica and I met for dinner, but stopped first at the 2007 Mr. 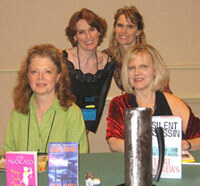 Romance Cover Model Contest. Half-clothed men strutted down the catwalk to the refrains of the song, “Save a Horse, Ride a Cowboy.” And I was pleased that Jessica Speart—and her alter ego, special agent Rachel Porter—were around to save not only the horses, but the rhinos, bears, and butterflies. 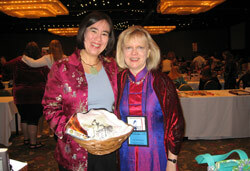 Jade Lee presents Lori with a basket of Jade's books.